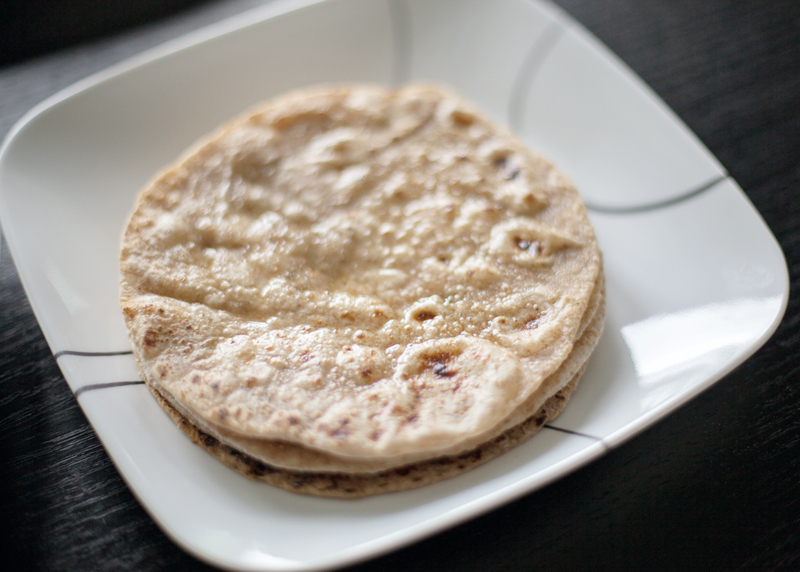 Roti is an indian flatbread. There are many ways to eat roti. It can be paired with a curry or eaten on its own. 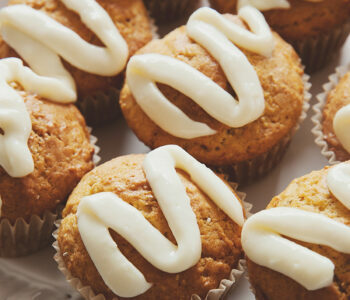 My kids love to have it with butter and honey spread on top. It can be intimidating to make roti, but its really not too bad once you have made it a couple of times. It’s one of those things where practice makes perfect. You can make Roti with whole wheat flour or special chapati flour (can be found in the ethnic section at large grocery stores). 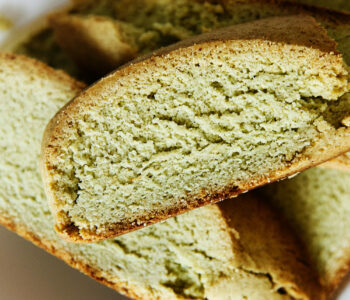 I prefer whole wheat flour since it is slightly healthier. One of the trickiest parts of making rotli (roti) is to get it to fluff up with air while it is cooking. You need this to happen so that it doesn’t become dense and heavy. A strategy that my mom taught me is once you have separated the dough into smaller balls, flatten each ball and brush a tiny bit of olive oil on top. Sprinkle on some flour and then pinch the dough around the oil/flour portion back into a ball. See above photo for a visual. Another crucial point is that the pan (you can use a tawa or a griddle) must be very hot before you start. Make sure that you have the burner running on medium to medium high heat for at least 5 minutes before you start cooking the first roti. 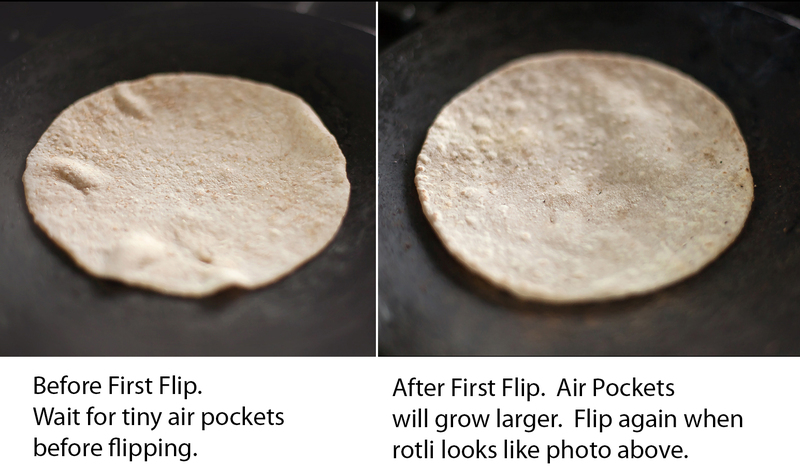 The above photo gives you a visual for what the roti should look like at each phase of cooking. Note that it does not take much more than 2 minutes per roti. With the right temperature, the roti should balloon up. If the temperature is too high, the roti will burn before it gets a chance to balloon up. And if temperature is too low, it will not balloon up at all. Step by step instructions for how to make roti. Add flour to mixing bowl. Set aside 1 tbsp of olive oil. Slowly add 2 tbsp of olive oil to the flour. Mix thoroughly until all of the clumps are gone. Add the water slowly. Mix together with your hands and knead the dough a few times. If the dough is sticky, add a bit more flour until it no longer sticks to your hands. Place the dough back into the mixing bowl and cover with a towel or saran wrap. After half an hour, remove the dough from the bowl and separate into 8 smaller balls. Place skillet (tawa) on the stove and turn on heat to medium high setting. 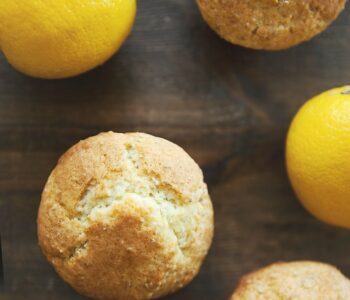 On a lightly floured surface, flatten each ball and brush with the olive oil that you set aside. Sprinkle with flour and pinch the sides up so that the flour/oil section is in the middle of each ball. Using a rolling pin, carefully roll each ball flat on a floured surface. You need to roll it out slowly to make sure that it is not sticking to your surface. If it feels sticky, flip the dough and sprinkle with flour and continue to roll it out. Once the rotli is as thin as you can get it without it tearing, carefully place it on the pre-heated tawa or griddle top side down. As soon as you start to see little air bubbles forming, flip the rotli. The air pockets will start to grow larger now. Flip the roti after they are a decent size. See photo for how the roti should look if you are not sure. 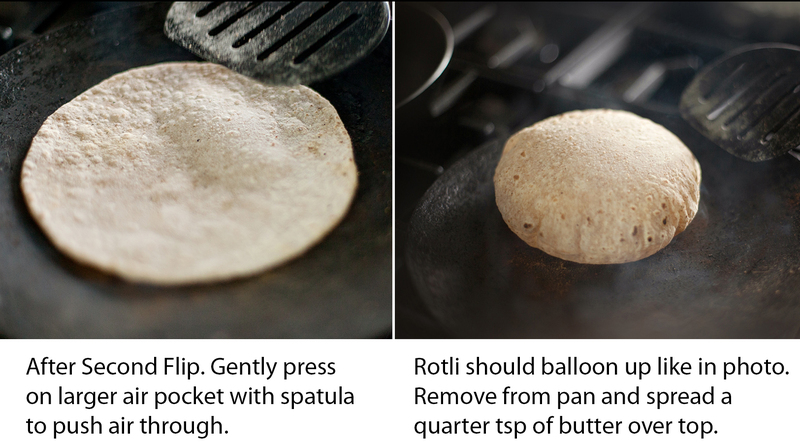 Place a light amount of pressure on the rotli with a spatula to push the air throughout the rotli. Once it has puffed up you can remove it from the stove. Spread a small amount of butter on top of cooked rotli to keep it moist. Repeat for the remaining 7 rotis.